Tonights Stars - Sharks matchup is a big one for Dallas. Not only do they need to win just about every game through the end of the year to have a chance at the playoffs (not likely barring divine intervention), but they need to see what the big Fin netminder, Kari Lehtonen, has up his sleeve to give GM Joe Nieuwendyk some idea of what the stars will have in net going forward. Having not seen either of his two appearances first hand, it is hard to know exactly how to interpret Lehtonen's poor numbers. I know everyone is cutting him some slack because of his long absence from the NHL, the Stars pourous defense, and the fact that his first start was against the defending champs, but he needs to show at least a gilmmer of hope that he can be the stonewall of the future, otherwise dire times, for both the club and anxious fans, are ahead for Dallas. I believe that Kari has the right tools to be a great goaltender, and if a stronger work ethic, somthing I hear may be lacking in his game, can be instilled by the leaders of the team (read: Brenden Morrow and Stephane Robidas), that talent could be realized and help bring Dallas back to contender status in the West. Thinking about where this team is currently positioned as a franchise - mediocre in the standings and on the ice, but with a fairly deep pool of young talent, prospects and a high draft pick coming, cap room, and a ownership situation that will hopefully be resolved in the near future - the future does not look so bleak. Specifically, the Stars have their recent first-round pick Scott Glennie performing well in Junior, he maybe a year or so away, and they have the prospect of picking in the top 10 in a deep 2010 draft, starting a new direction for the club. I do not know how the Stars will regroup after two (probably) non-playoff years, but for the rebound year to be in 2011, the Stars will need to hope that Lehtonen can shine, and the front office can shore up the defense. If those two things happen and the Stars can have a confident, efficient, puck-moving back end with a reliable safety net in goal, then a Marc Crawford system could function as drawn up, utilizing many of the Stars talented and gritty forwards pushing the pace, and Dallas may have a chance to head to back to better days. It has taken me over a week to shake the funk that I found myself in after the US lost to Canada in the Olympic gold medal game, in what to me was one of the greatest sports events that I have seen in some time. On that Sunday, I strolled out of my apartment with a few friends clad in my 1980 USA sweater and other obnoxiously American accessories (read: 10-gallon cowboy hat) and proceeded to cozy up in a bar with large majority of Canadian patrons. Now, Canadians are generally pretty nice people, so while I and my company heckled every Canadian player (I laid off Brenden Morrow, I just couldn't bring my self to besmirch the Dallas captain), they more or less laid off ours, and on many occasions chuckled at some of our more ridiculous taunts. When Zach Parise tied the game in the final minute, I found myself at the top of my hockey enthusiasm (arguably on par to when Brett Hull scored the cup clincher in 3-OT), and then 20 minutes later met my low. 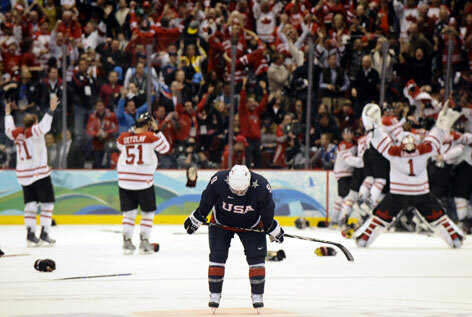 I mentioned that the Canadian fans were not to harsh on the US through out the game and that continued after Crosby won them the gold, and thank god, because I am not sure how I would have handled an annoying gloating Canadian fan. I digress, but the moral of the story was I was in a serious funk. I watched no hockey for an entire week, didn't check standings, or my fantasy team, or even survey the blog sheets - nothing. See, usually a sports loss of this magnitude comes when you have an entire offseason to take away from the game (see: Stars loss to Devils in 2000, Rockies loss to Boston in 2008, and many every Denver Broncos season since 1998). However, since the NHL season got back into gear the NEXT DAY, there was no time to get over the loss away from hockey, and thus I took my own hiatus. Now that I am back, partially thanks to a nice come from behind, on national tv, win by Dallas (i.e. Marty Turco) over the Capitals, I am ready to share my thoughts on the two weeks of hockey glory that were the Olympics. Non-Obvious Stand Out Players: As a general hockey enthusiast I watched just about every game of the tournament, and focused really on watching individual players. After the games in Turin, a few Olympic standouts made the switch to the NHL (namely Finland's Ville Peltonen), and as a wannabe GM thought I would try and find this years. I was really impressed with a number of guys and will now present my list of Top 3 non-obvious Olympic Standouts (as in they are not current NHLers). 3. Ziggy Palffy and Jozef Stumpel - How about a nice turnout for two guys who I thought were distant memories of hockey players. Turns out both still play and both managed to put together a nice tournament for a Slovakian team that has to be considered the surprise of the tournament. Yes, I know they were more stacked than some of the lower tier teams, but they played every team tough, ousted the defending gold medalists, and came one cross-bar away from taking Canada to overtime (coming back down 3 in the third, and the Canadians starting to look very shaky) for a spot in the gold medal game. Eight points between the two of them and a nice throwback to great hockey names of my childhood. 2. Edgars Masaļskis - The Latvian goalie was an absolute beast through much of the tournament. Yes I know the Latvians got smoke in 3 of their 4 games, but it was not because of this guy. He faced an incredible 170 shots in his games (~43 a game) against three of the more stacked teams in the tournament (Russia, Czech Republic, and Slovakia). The highlight of his tournament was in the qualifying game with the Czech Republic where he stopped 47 of 50 shots and willed the Latvians to a third period comeback, until late into OT when the Czechs managed to get one by him to take the game and advance. I was up late watching this match and went from dozing off early in the third period to being completely up and alert watching this guy frustrate and bewilder the Czech scorers while at the same time driving the momentum his team needed to tie the game late and send it into OT. 1. Roman Wick - Admittedly, I spent more focus watching this Swiss forward as the Group A (Switzerland, Norway, Canada, US) games were at better times and I had more of a vested interest. But in the four games i watched closely, SUI v. US (Prelim), SUI v. Canada, SUI v. Belarus and SUI v. US (Quarter final), Wick was constantly the most noticeable forward on the ice, and that says a lot considering the talent that he was playing across from. As the Swiss leader in forwards ice-time (85 minutes in 5 games = 17 minutes a game) and points (2-3-5), Wick not only was the most effective Swiss forward but he did it against the best lines on the opposing teams. The last two hockey weeks have triggered some feelings of nostalgia for me. First, one of my all-time favorite players, and one of three members of the Dallas stars who were so influential on me growing up that I have used their numbers in some fashion for every pin and password that I have, was rightfully inducted into the hall of fame. Brett Hull - the current Dallas Stars Ambassador of Fun - is in the hall alongside his pops and other great players across time. 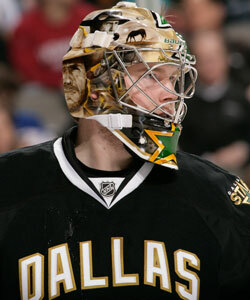 When Brett came to the Dallas Stars I was around 12 years old and was about to start my first year of pee-wee hockey. I was going to play for the Dallas Jr. Stars that year, but had to make a very important decision on the number that I would wear. I had a lot of idols to choose from, but once Golden Brett announced his signing to my favorite team, his #16 was a no brainer choice. 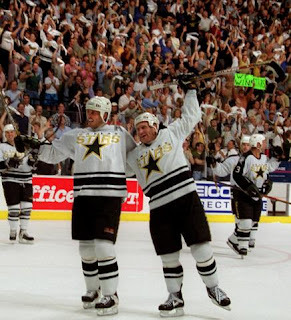 Yes, the "Little Ball of Hate" Pat Verbeek was already #16 on the Stars so Hull had to wear #22, but that didn't matter to me, because as a Hull fan he was always going to be seen as #16 to me(after Verbeek left the Stars Hull did reclaim his famed number - though he did win the cup as #22 and lost as #16 but that's a whole new discussion). Brett did not disappoint on the ice in his time in Dallas between winning the Cup in Buffalo, delivering an unbelievable opening to the new millenium, netting his 600th and 601st goals on New Year's eve and ushering in the Hullenium, and many others before and after. Off the ice, Brett was funny and engaging and was simply likable. Hull said recently "I got to play with wonderful players, and I made sure when I played I was just having fun. I figured if I was having fun, then the game was going to go the right way for me." That kind of attitude is what made Hull a special player and a special guy. The second piece of news that interested me this week was the retirement of Brendan Shanahan. As a guy that I always had to watch as an opponent to my teams (as a native Coloradan I have hoped on the Avs bandwagon when the Stars were out of contention) I was a bit scared when he was on the ice. He seemed to always make something happen, with either a big hit or just occupying space in front of the net, but he also had the ability, much like Brett, to get lost on the ice and then reappear as he was following through on a one-time that ended up in the back of the net. In addition to his undeniable knack to score goals, Shanahan was one tough S.O.B. When I heard Shanny was retiring I immediately went to hockeydb to look at his career stats to think about whether he will be a hall of fame inductee. In my estimation, and likely anyone who follows hockey, he will be a shoe in. The most striking statistics that Shanahan put together were that while he amassed a total 656 goals, he also managed to spend 2,489 minutes in the penalty box. No other NHL player has gained entry into the 600/2000 club, which means Brendan Shanahan is a BEAST. The 600/2000 club, or for now "Club Shanny" has become a fascinating idea of study for me. Considering that I label myself as a fan of the economics of the game, I though I would turn this fascination into something quantitative. The question that I wanted answered was, controlling for games played, who else should, would, or is likely to join Club Shanny. Below is a table listing the career stats of every NHL player who has scored at least 600 goals, and a few other players who on my own intuition I thought may be on pace to make the 600/2000 mark. The blue shading shows players who at their per game pace of scoring and sitting in the penalty box would or will join Club Shanny if they do or had played in the same 1,524 games as Brendan (The names in red signify active players). Cam Neely was really no surprise to me for goal scoring or shenanigans, but I really let it creep out of my mind what an offensive talent that Tkachuk had. The two other guys that I think should get mentioned for the offensive might, and general ruggedness are Pat Verbeek and Rick Tocchet. Had each of them made it to play 1500+ games, they were dangerously close to being on pace for 600 goals and yes, 3000 penalty minutes! That's the equivalent of spending 50 entire games in the penalty box. I guess you don't end up looking like Tocchet or being called the Little Ball of Hate for nothing. Impressive stuff guys.